Portsmouth, RI. October 3, 2018: CDV Systems is offering a free online presentation outlining how 500+ room family and data templates were created, managed and batch loaded into 85% of the 14,000 Revit rooms of Cannon Design's new 3.5 million sf hospital called CHUM: Centre Hospitalier de l’Université de Montréal. This 60 minutes two-part BIM presentation reviews the overall room template process and ends with a live BIM demonstration of the workflow. 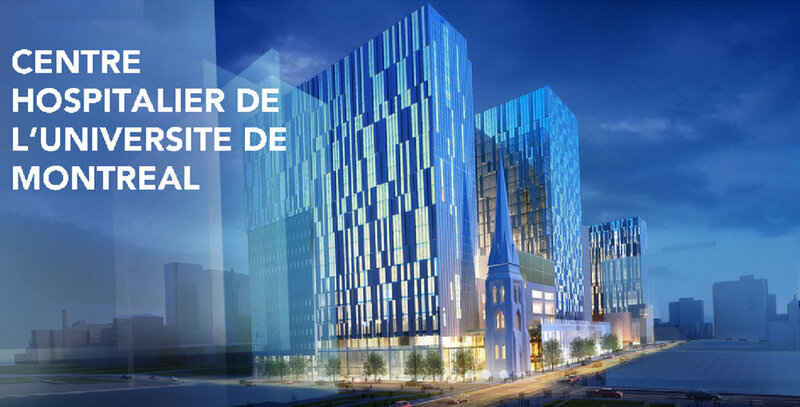 Set in the heart of Montreal, the new Centre hospitalier de l’Université de Montréal (CHUM) is changing the landscape of the Canadian metropolis. Occupying two full blocks, CHUM is the largest healthcare construction project currently being built in North America—and among the largest in the world. "We had a terrific working relationship with CDV. Being the one of the largest projects fully executed in BIM with so many unique needs – dual language capabilities, staffing sizes and locations, equipment tracking, etc., we realized we needed the support of industry BIM leaders to supplement our team. Luckily we found CDV Systems who became an integral part of our overall team and helped us leverage tools, techniques, and talent to a new extent. Along with CannonDesign’s platform; we were able to utilize a team of 180 +/- architects in 5 times zones using the files with high consistency and quality." THE JOURNAL OF THE AMERICAN INSTITUTE OF ARCHITECTS (20160901):TACKLING NORTH AMERICA’S LARGEST HEALTHCARE PROJECT IN SEVEN STEPS: THE $1.5 BILLION UNIVERSITY OF MONTREAL HEALTH CENTRE REQUIRED CANNONDESIGN AND NEUF ARCHITECT(E)S TO INNOVATE THEIR TECHNOLOGIES AND PROTOCOLS. In addition to Revit, the team made extensive use of CodeBook, a database application tailored to capture and manage healthcare room and equipment requirements. In CodeBook, users can identify key or “exemplar” rooms, like exam, operating, and patient rooms, that then become templates, allowing the designers and medical planners to work out the requirements of each room type with the specific CHUM user group, and then apply these requirements to all corresponding rooms. CannonDesign estimates that Codebook cut the time needed to populate the model by half, as compared to manual input. Likewise, because healthcare technologies are rapidly evolving, an upgrade in room equipment can be pushed to all 442 exam rooms, 39 operating rooms, and 772 single-bed patient rooms with a single click. “This year’s competition brought forth companies that have shown great devotion to pushing their companies forward using modern technology,” says Peggy Smedley, editorial director, Constructech.